Continental (or Continental Temic Electronics) Toastmasters Club may be the last club I'll be visiting for the year. Knowing the holiday rush can be terrible at this time of the year, I left home around 9:30 am for the 11 am meeting at Continental. I was still early at 10:35 am. Attending in today's meeting Continental were: Raul de la Vega, Marivic Turalde, me, Rodelio Tan, Ykhon Yabut, Wenci de Guzman, Aleita Mahinay, Jinnessa Catapia, Karisse Gonzalo and Jeffrey Lim. At the moment, I could only identify those who had taken meeting roles in the program. I saw some new faces, but in time, I'm hoping to know them all by name. I learned from Jeffrey that most, if not all, of today's attendees were from ITCA department or Information Technology Center Asia. The club meeting's theme for today was "Hero of the Day". For Table Topics, there were a couple of respondents: Wenci and Mark, tackling the questions: "What makes someone a hero?" and "Why do people need a hero? ", respectively. It's good that this meeting did push through. There were a couple of cancellations previously. 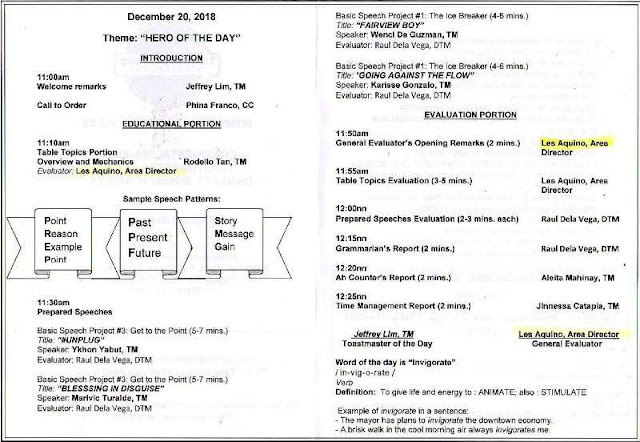 One was last Dec. 6, where AD Kate was supposed to attend. The second one was Dec. 13 where I was supposed to attend. Fortunately, at both times, Jeffrey was quick enough to alert both AD Kate and me. 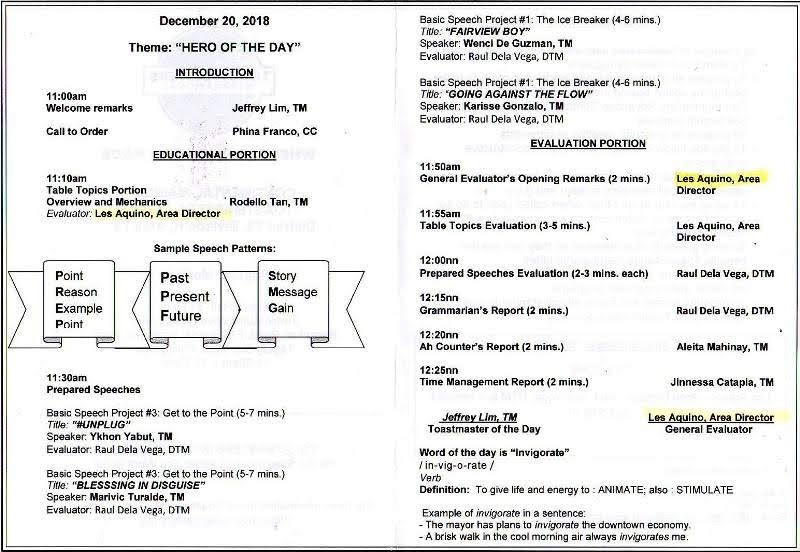 From the original line-up of three prepared speakers three weeks ago, today they had four prepared speakers and nobody backed out. It was a good productive and enjoyable meeting. Here's a scanned image of today's meeting program at the Continental TMC. Raul, Jeffrey and I had lunch after the meeting over at the Continental cafeteria. We even discussed my Intermittent Fasting as I journal it in the Fitness Challenge. This and the plans for the club meetings next year, of course. After lunch, Jeffrey gave a few tokens for Raul and me. He gave both of us three items: ballpen, notebook and a ring hook. All of them bearing the company's Continental logo. Thank you so much, Jeffrey Lim!